Must See leaked (Photos) of Android powered BlackBerry Device. A leaked render of BlackBerry'supcoming Venice slider phone shows the device running Lollipop, instead of BlackBerry's own BlackBerry 10 OS. There have been rumors that BlackBerry was working on an Androidpowered device, but until now we had no idea just how that would look. One of the most notable things about the render that surfaced is the apparent inclusion of Google Apps on the device. This would mean that BlackBerry worked with Google to have the device pass Google's Compatibility Test Suite, instead of just forking an Android version that didn't include the services. 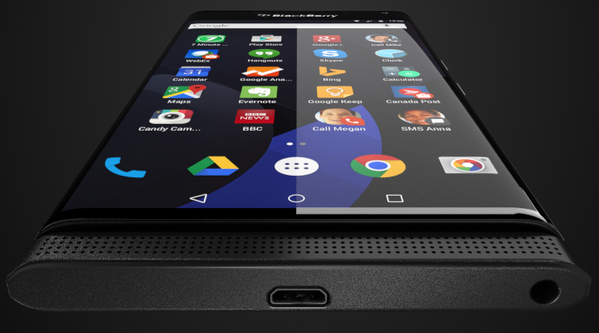 The BlackBerry Venice is rumored to launch this fall, and is apparently heading to AT&T in the US. BlackBerry has been known for its keyboard hardware, but many didn't like the software. With so many great third-party keyboard options already available for Android, is there even a need for a physical keyboard device these days? Either way, it shouldn't be all that long before we find out what BlackBerry has up its sleeve.